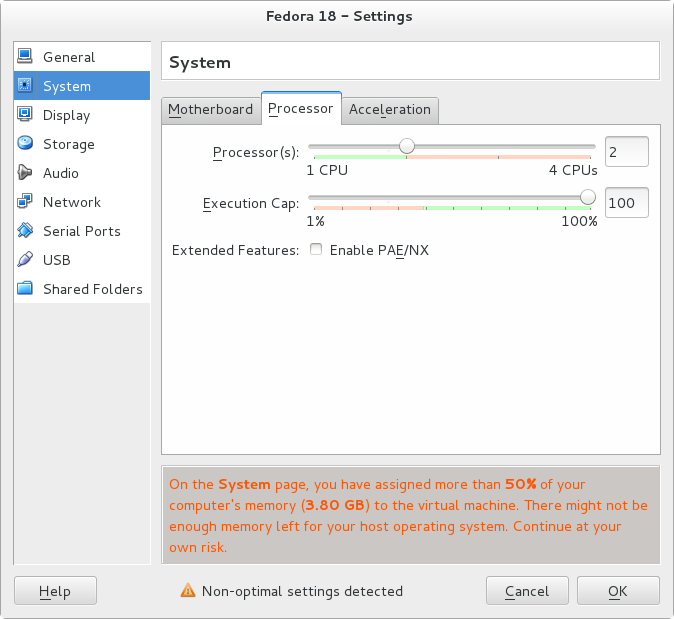 Fedora 19 is out! 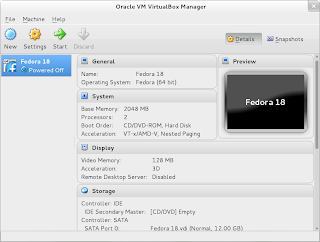 Check out Install Fedora 19 on VirtualBox with Guest Additions. 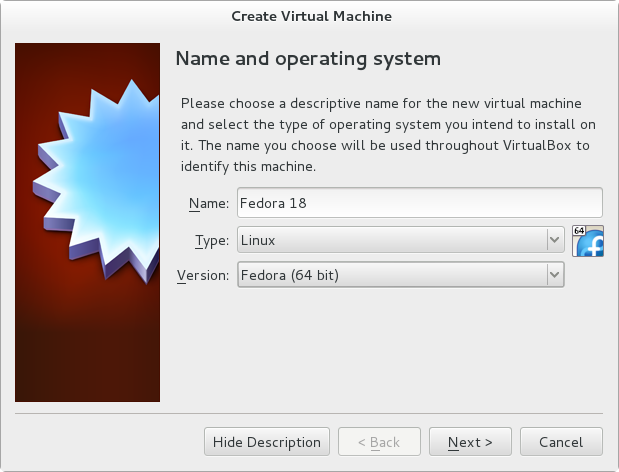 This post is about installing Fedora 18 on VirtualBox as guest OS including installation of VirtualBox Guest additions. For installation of VirtualBox on Fedora 18, please refer to this post "Install VirtualBox on Fedora 18". In the VirtualBox Manager, click "New" to create a new virtual machine. Enter the name of virtual machine, the type of operating system and indicate whether it is a 32-bit or 64-bit operating system. Select the memory size for this virtual machine. 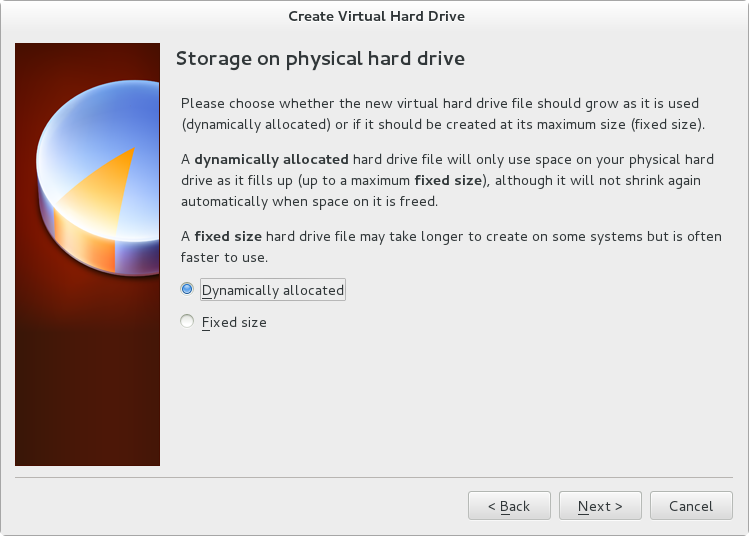 To create a new hard drive, select "Create a virtual hard drive now" and click "Create". Select "VDI" and click "Next". Opt for "Dynamically allocated" and click "Next". Finally, enter the name of your virtual hard disk and specify the maximum hard disk space allowed. Previous I encounter some problem while using the default 8 GB. I've set it to 12 GB. Next, you need to go into the setting for more configurations. On the screen below click on "General" or "System" to activate the setting page for this virtual machine. The setting page is shown below. For multicore PC, you can change how the guest OS utilize the CPU. The default is 1. Under display, expand the video memory to the maximum and enable 3D and 2D acceleration. 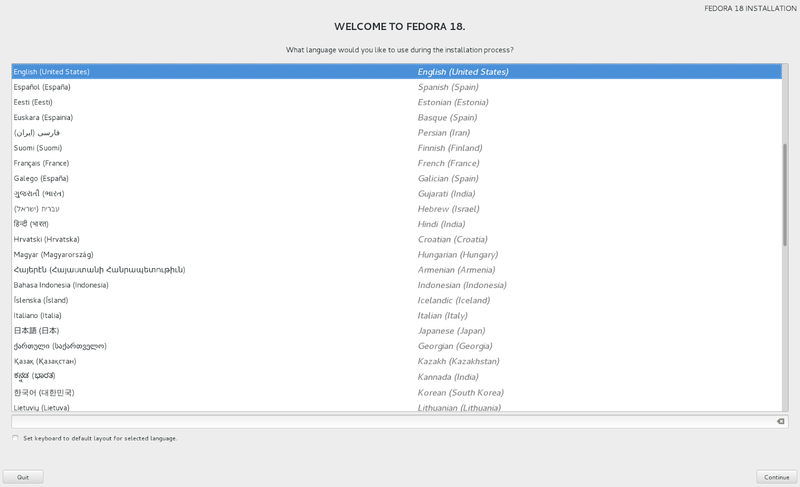 You can download the latest version of Fedora from the home page https://fedoraproject.org/ or you can get Fedora at https://fedoraproject.org/en/get-fedora. Click "Download Now" and you will download a disc image in ISO format named "Fedora-18-x86_64-Live-Desktop.iso". 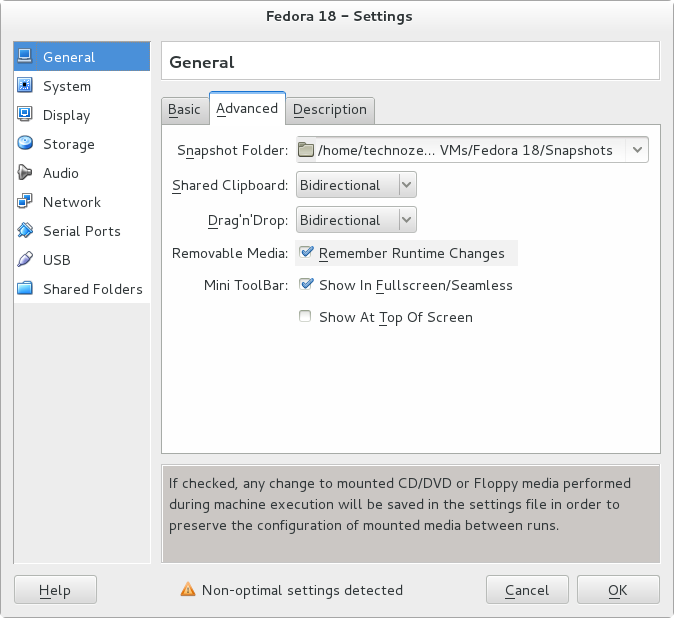 Alternatively, if you would like to download other spins or the full DVD, there are more download option at https://fedoraproject.org/en/get-fedora-options. Select the virtual machine you want to start and click "Start". 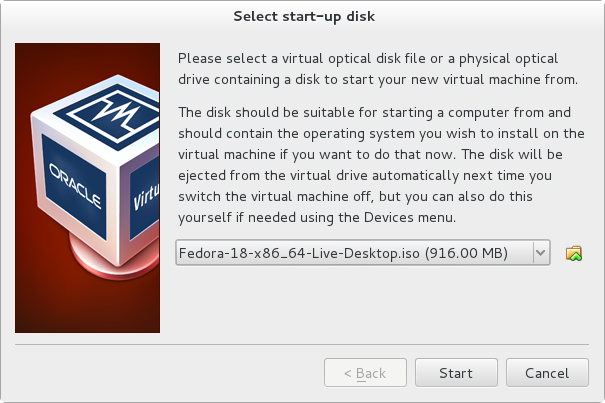 For the first time the virtual machine will prompt you for installation disk. Navigate to the folder where you stored the ISO and select the appropriate ISO. I will briefly run through the installation process. 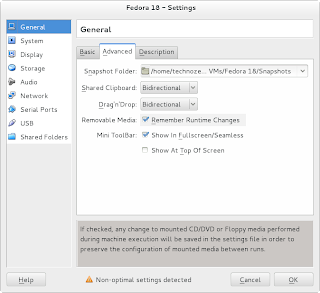 For detail configuration, please refer to my post Fedora 18 Installation Guide. On the welcome screen, click "Install to Hard Drive". 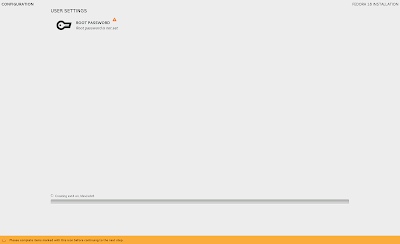 The first screen appears and you need to select the appropriate language for your system. Click "Continue". 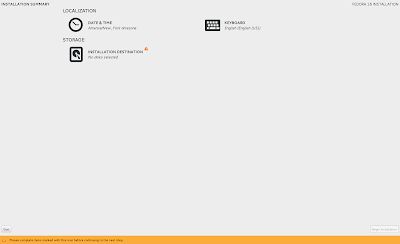 On the next screen, you can configure Date & Time, Keyboard and the Installation Destination. 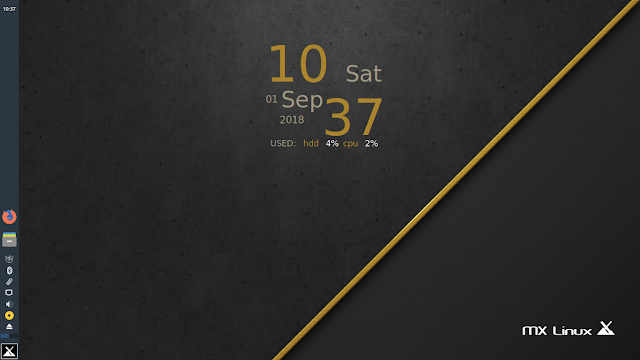 Use the default for Date & Time and Keyboard. Click on "Installation Destination". The screen will show your only only available hard disk on your virtual machine. Click "Continue" on the lower right corner. 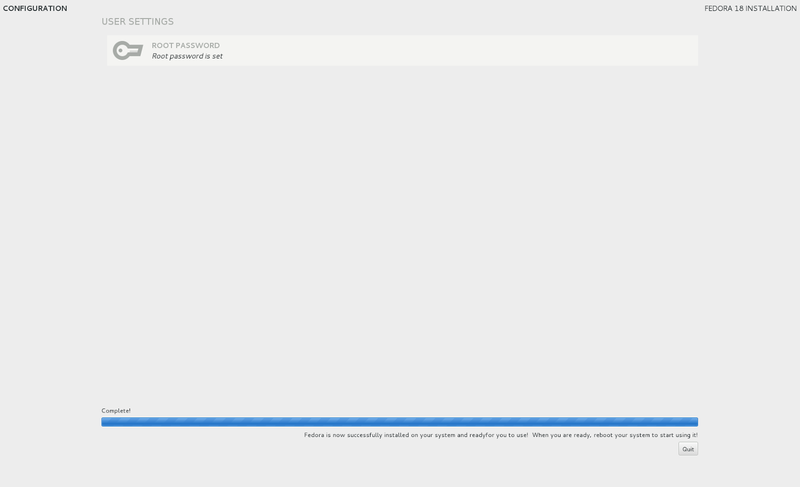 For the next screen "Installation Options", use the default and click "Continue". If you prefer to configure the hard disk manually, please refer to my post Fedora 18 Manual Disk Partition. If your hard disk configuration is complete, you can proceed further by clicking "Begin Installation" on the lower right hand corner. Next, you need to setup the root password and wait for the installation to complete. 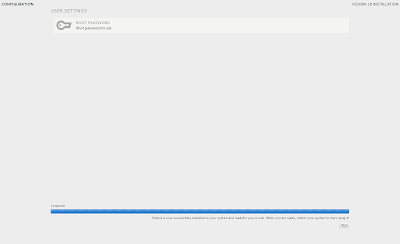 Finally, when the installation is complete, select "Quit" to exit the installer and reboot the system. After system reboot, you need to perform additional setup. Follow the wizard and setup a new user account. Click "Finish" when you are done. Finally the system will prompt you to login. This signal the completion of installation. For post installation configuration please refer to my post Fedora 18 Post Installation Software Configuration Guide. 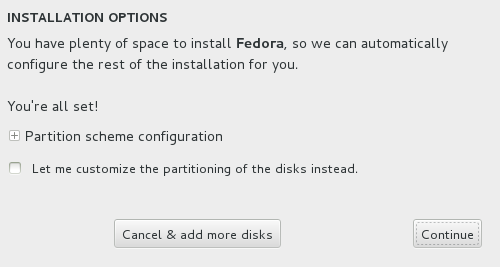 You need to install the Linux Guest Additions in order to share data and folders between the host and Fedora client. The use features are sharing of clipboard and sharing of file using drag and drop. Please reboot the system if you have just installed a new kernel. Click cancel if they ask if you want to run the disc image. You need to reboot the system after the installation is complete. If you could not find the path /run/media/$USER, please note that you could not find the path under Cinnamon desktop. 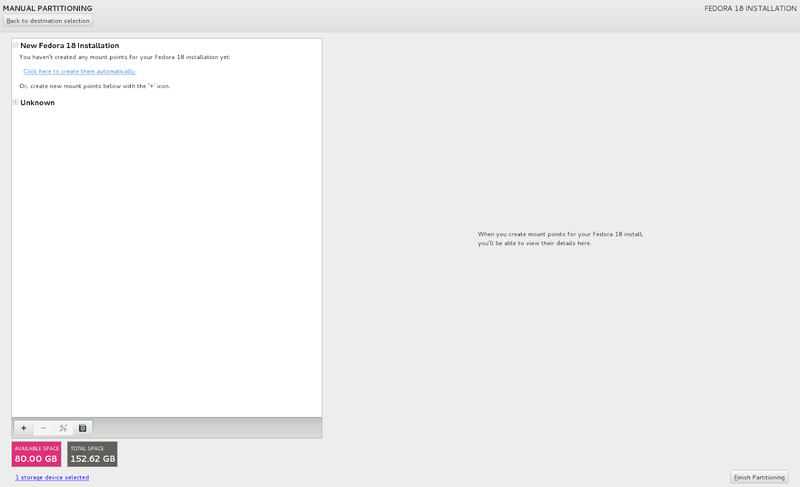 You need to logout and login using GNOME or MATE. 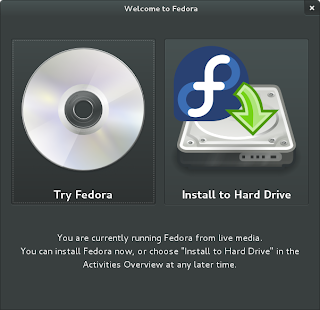 Please note that I've install Linux Guest Additions on Fedora 18 as guest OS on Fedora 18 host. 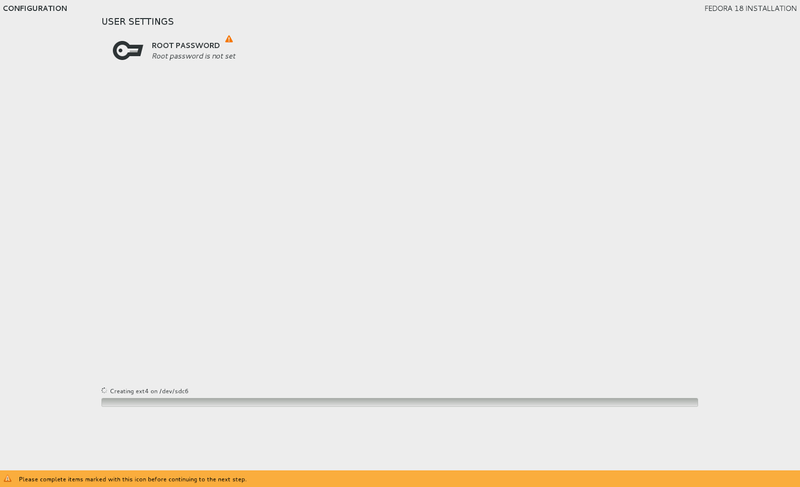 After Linux Guest Additions is installed, the guest system appears to have some display problem when login via GNOME3 (GNOME and Cinnamon). I could only login via Mate desktop. I did not encounter such problem when I was installing Fedora 18 as guest OS on a Windows host. Thanks for the detailed setups. Do we need the iso imaage when we start the VM next time ? I followed the same steps and next time when I restarted the VM all fedora installations are gone. No ISO image is required after installation. You must manually remove the ISO image from the VM, otherwise the system will boot from the ISO image again.